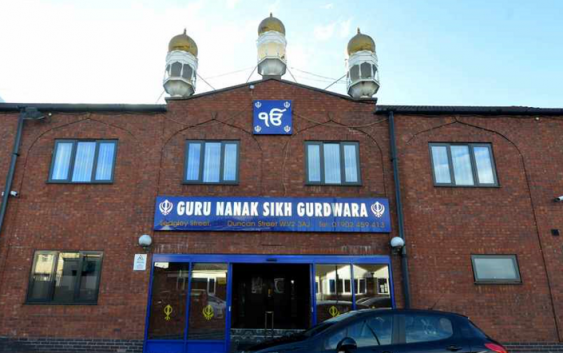 Disabled and elderly worshippers at the Guru Nanak Gurdwara in Sedgley Street, Blakenhall, brought a legal action against the temple’s ruling committee over alleged discriminatory practices. They claim members of the congregation who are unable to observe the custom of sitting on the floor are excluded from the main prayer room and are forced to sit behind a screen in the dining room. It is thought to be the first case of its kind in the country. At Birmingham County Court on November 19 a district judge suspended the case and gave both parties two months to resolve the dispute. Tony Muman, a lawyer representing the claimants from the 43templerow legal firm, said his clients were doing all they could to reach an agreement with the Gurdwara’s committee. He said: “The case is now subject to mediation. If it is not successful then we will be back in court in two months time. Mr Muman said he has already contacted lawyers representing the defendants to try and find a compromise. Committee member Manjit Singh said: “We will always welcome mediation and hope we can come to an amicable solution. Meanwhile the temple is also involved in another legal battles stemming from a violent flare up during the election to form a new committee in May. Following the incident the Charity Commission wrote to the committee and told them to step down on the grounds that the election was unconstitutional. The committee refused and took the commission to court to dispute its ruling. But it was thrown out at Birmingham County Court on November 6 on the grounds that the court had no jurisdiction to hear the case. Charity Commission spokesman Joshua Snape said the commission was in the process of examining the court’s decision. Meanwhile senior figures among the congregation have voiced their anger over the legal disputes. One of them, Councillor Milkinder Jaspal, said: “These issues are very costly in terms of legal fees. The concern is that the money is coming from donations from the congregation.